As we work to reconstruct the field of genecology, or experimental taxonomy, in Britain as part of the Genecology Project, we have started by scrutinizing a list of researchers assembled in 1964 by David H. Valentine in the Botany Department at Durham University. The list was meant to be inclusive as possible: graduate students and research staff are listed alongside senior figures in the field, and the list includes researchers who openly and publicly disagreed with Valentine about the nature of genecological research and its core concepts. At least 9 of the 87 researchers on the list are women (many are identified as "Miss" or "Mrs"). Twenty five institutions in Britain, and one (Trinity College) in Ireland are represented. To get a rough sense of the geographic distribution of researchers in the field, I put together a very simple visualization using Google's GeoChart package, a part of the Google Charts API. Google has a small set of regional basemaps, and supports two display modes: a regional mode, in which data are attached to geographic areas, and a marker mode, in which data are attached to markers plotted on specific points. I pulled positional information for each institution (often the city in which the institution was located) from GeoNames. GeoCharts support both color and size maps for representing discrete or continuous values associated with each datum. In this case, I plotted each institution as a marker, with the number of genecologists at each institution represented by both marker size and "greenness." The screen-grab at right shows the result. When markers are close together, hovering opens a "magnifying glass" that makes the markers more easily selectable. 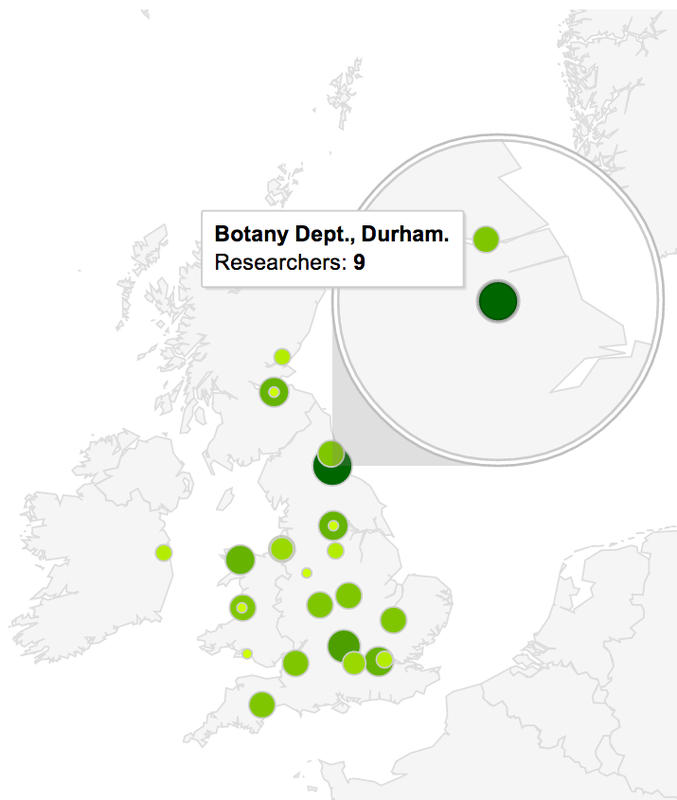 Unsurprisingly, the largest node on the map is Valentine's own Botany Department at Durham. Other major centers include the Scottish Plant Breeding Station at Edinburgh, the Welsh Plant Breeding Station in Aberystwyth (western Wales), and the Botany School at Oxford University. You can view the code (minimally adapted from the examples in the API documentation) and data here.